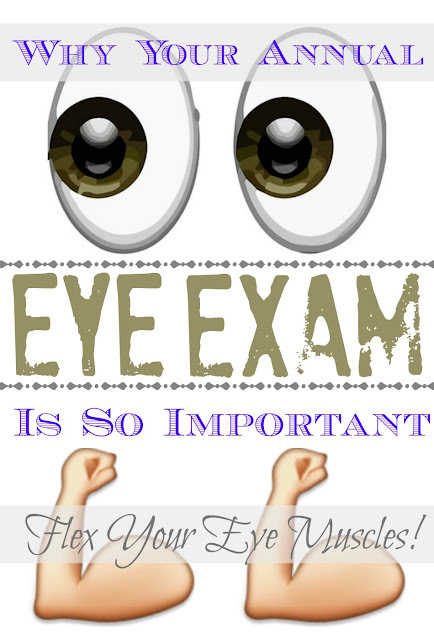 Physical fitness is easy to remember (hit up that gym, get that yoga class in, etc) but are you flexing your eye muscles by remembering your eye health and annual exam? I've worn glasses since I was in the third grade. I'm now so near sighted that I almost reach the textbook definition of legally blind. But even for me, a woman who depends on her glasses and contacts, it's hard to remember to schedule my annual eye exam! I'd cut off a toe before I missed my favorite yoga class, but flexing my eye muscles and heading to get these big browns checked out? That's challenging. Here's the thing though. In early April, I ran out of contacts. I even stretched out my "monthlies" to be more like "6 weeks-lies" and then tried to call for more contacts. No way, the office told me, you haven't been seen in two years! Get in here and get checked. So I went in and found a whole new set of technology was available! I was able to get special images done of my eyes and learned that I'm so nearsighted and my eyeball is so long, I'm at an increased risk for a retinal tear. I also learned that me extending my contact "expiration date" was aging my eyes and contributing to my retinal tear risk! Not even kidding, she took one look at my eyes through some fancy machine (I'm really well read on all those fancy medical terms, huh? ), and before I could even confess that I wear my contacts far past the point that I should, my doctor was able to guess it! And then scolded me, like she should have. Because of that appointment, my doctor was able to discuss with me the warning signs of the tear and when I should make an appointment vs. when I need to go to the emergency room immediately. I had no idea about any of this! I'm 31 years old, why would I even consider something like that, right? That right there friends demonstrates the importance of your annual exam. 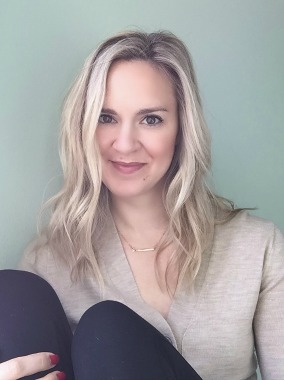 Even if you have perfect vision (like my sister, who got all the good eye genes), they might find something that you need to monitor, or discover something in your family history that puts you in a different risk group. Your eye sight is a big deal. You lose it, and your life will NEVER be the same! So why are people (and by people, I mean me too) so bad about making that appointment? Don't have an optometrist? Think About Your Eyes created a handy Doctor Locator tool to make it easy for you! Please make sure you're flexing those eye muscles and getting your annual eye exam done. Your eyes will thank you for it. Speaking of......I was just called for my reminder for my eye apt ;-) I have had Lasix done so I remember what it was like to be blind and then have sight finally. I do not joke around with my eyesight. This is such a great reminder. I love the graphic and that you're bringing awareness to eye health. So important! Ugh. I need to schedule an eye exam. Thanks for the reminder. Luckily I stocked up on contacts last time, but I'm running low again. Yikes. I wore glasses and contacts forever, then had PRK (similar to Lasik) a few years ago, but I was so kind they couldn't get me to 20/20. So now I wear glasses to drive and watch TV. I'm pretty religious about my eye appointments. This is a good reminder to schedule this year's appt. I really need to get an eye exam soon! Thanks for the reminder. ugh you are so right. need to get my act together and get my eyes checked. it's been like 5 or 6 years. sleepSEE is the most effective and safe invention of modern science which provide you with the most clear and comfortable vision using the science of ortho k. It is a nonsurgical vision correction system and quickly becomming the number one choice for vision correction. Those peoples who have overweight issues scan for the health mentors that offers individual preparing. at that point they should buy PhenQ Ultimate online. Since the ingredients of PhenQ are highly refined which settles on it the best choice among others. The refined ingredients of PhenQ is likewise its USP which causes clients to remain fit and energized parallel to losing weight. According to the Phen375 purchase. Working out tips and strategies help you to continue with the lifting weights frameworks that suit your body to great. Knowledgeable post have been shared bny you. I love reading your blog. You can contact top Eye doctor in Westchester which provide better treatment in affordable price. Thanks for sharing this unique and very useful blog. If dynamic wrinkles are making you look older than you should visit, Dermatique Skin Spa can smooth these out and give you a more youthful appearance. Impressive! So nice information you have shared with us, thanks for taking your time to post this. Both men and women seek cosmetic surgery to feel more attractive and confident about their appearance.For the Anti Wrinkle Treatment you can visit on Anti Wrinkle Treatment London for the more details.